Fall is a fun time for most families. There are pumpkins everywhere: on people’s front steps, on porches and even inside the house. 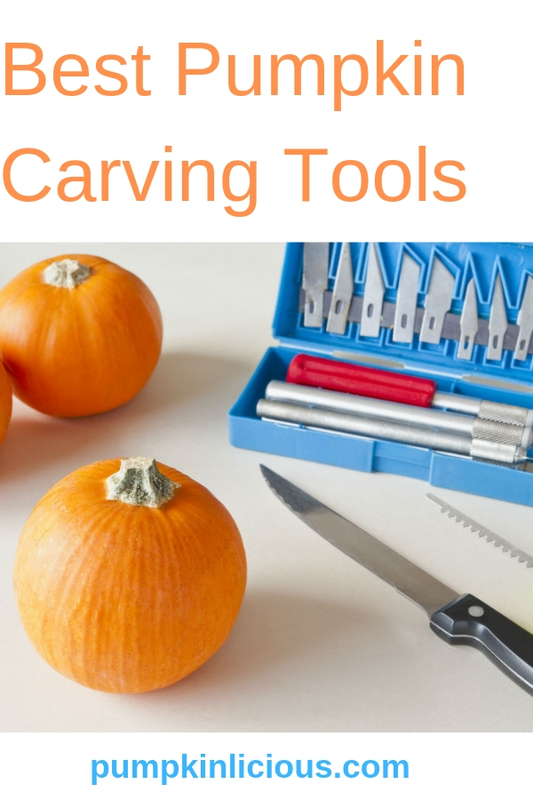 Pumpkin carving is a family affair for many of us, and for that we need pumpkin carving tools. The Irish had the tradition of carving faces into large potatoes and turnips and when they immigrated to the United States, they brought the tradition with them. Soon after the immigrants arrived in America, they found that pumpkins were easier to carve. Pumpkins made the perfect object for carving and it inspired many to be creative. Today, carving pumpkins is a form of art that provides fun for all walks of life. A variety of pumpkin carving tools can be used to carve pumpkins and to create comical or scary faces. This carving tool set by Bootiful is manufactured in a fun orange and consists of one scoop, a poker and two saws. The tools are made of stainless steel and are rust-resistant, strong and durable. Every October, pumpkins with glowing lights or candles can be seen at almost every doorstep in the United States. Some with more complex faces or symbols and others with simple fun or scary faces. Bootiful pumpkin carving tool set offers the perfect tools to hollow out and carve the pumpkin. Carving pumpkins are fun, but it remains important to remember that pumpkin carving tool sets are not suitable for children to play with. Once the workspace is set up and the design is drawn on the pumpkin, the saw from the tool set is perfect for cutting a lid at a forty-five-degree angle around the pumpkin stem. The scoop is an excellent tool for cleaning the inside of the pumpkin. Most pumpkins rot over time and it is advisable to buy your pumpkin not too long before the time you want it on your front steps. 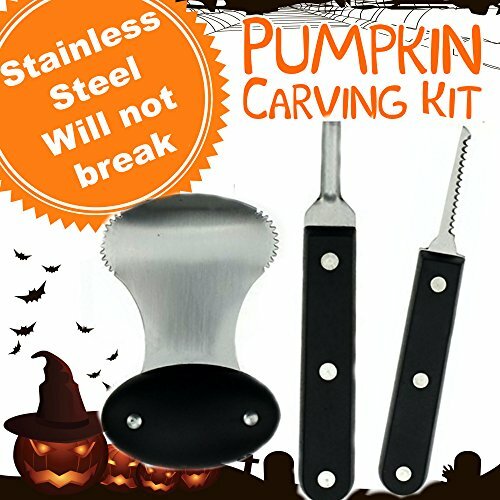 Bootiful pumpkin carving kit are strong and well-manufactured. But, the kit does not include covers for the saw and tools. Safety should be a concern as the kit does not offer finger guards. 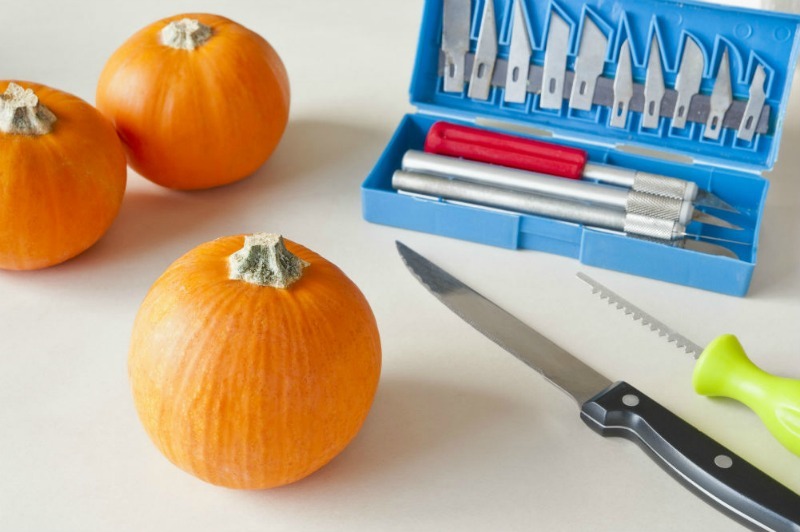 Similk’s pumpkin carving kit offers a set of twelve tools specially manufactured for carving pumpkins, vegetables, soap, wax, softwood, clay sculptures and rubber. The wooden handles are made of beech, a low-branching tree native to North America, Europe and Asia. The Sk5 high carbon steel has a hardness of HRC 65 and allows professional and beginners to carve pumpkins or softwood such as pine, hickory or basswood with ease. Safety has always been a high priority to the manufacturer. The twelve-set kit includes two finger guards made from durable cowhide leather for your safety. It is strongly recommended that you always wear the finger guard while carving. Similk carving kit includes a pinpoint tool, parting tool, rounded chisel, deep gouge, wide chisel, medium chisel, narrow chisel, shallow gouge, four angled chisels and a sharpening stone. The tools are mostly used for art projects and pumpkin carving and are not suitable for carving hardwood. Each tool has a protective cover to protect and cover all sharp edges and points. The covers are a great safety precaution and can prevent injuries. The tools are neatly packed in a durable nylon zipper case. 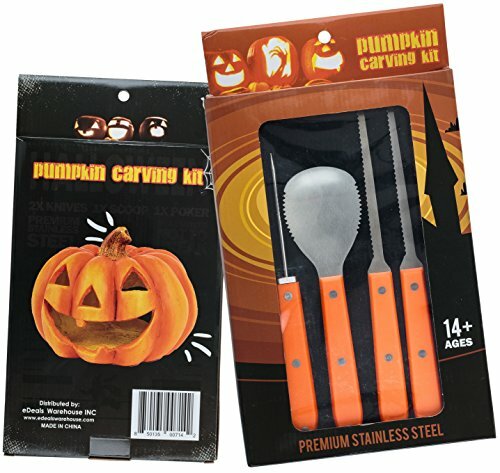 Similk’s pumpkin carving kit offers a complete set of everything that is needed for pumpkin carving. The kit includes two finger guards and safety covers for the tools. The tools are well-made and sturdy. This pumpkin carving kit includes a pumpkin scoop, carving tool and pumpkin saw. Sano Naturals’ kit is specially designed with a handle that offers an easy grip and rust-resistant stainless-steel blades. October is pumpkin season and an exciting time of the year to be fully creative. Pumpkins used for carving typically contain more water than varieties such as Cinderella Pumpkins, Rouge Vif D’Etampes or Pink Porcelain Doll Pumpkins. In colder weather conditions, a carved pumpkin can last for up to two weeks before it shows signs of decay, but in warmer conditions a carved pumpkin usually only will last for up to five days. It’s a good idea to rinse the pumpkin thoroughly in three gallons of water and three teaspoons of bleach before carving. Sano Natural’s kit is manufactured with pro level stainless-steel and of excellent quality. The blades are rust-resistant, and the handles provide a comfortable grip. The kit lacks safety accessories, such as finger guards and tool covers. 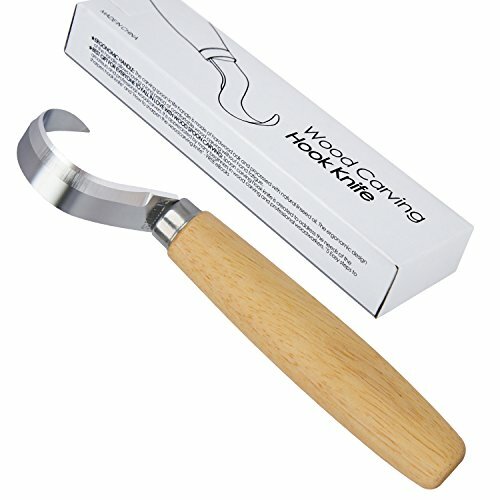 So, which one is the best carving tool for you? Bootiful pumpkin carving kit tools are strong and well-made. The carving tool kit offers a carver, scoop and two saws. Naturals’ kit is specially designed with easy grip handles and rust-resistant stainless-steel blades. The set consists of a scoop, carver and saw. Similk’s pumpkin carving kit offers a set of twelve high-quality tools including safety accessories. Similk’s pumpkin carving kit is the preferred pumpkin carving tools kit. Free Pumpkin Stencils – why not use your pumpkin carving kit tools for these free pumpkin template designs!